Two halves make a whole… right? A while back I ran the Adelaide half marathon as the 2 hour pacer. I enjoyed it so much and found it so rewarding that within days I had signed up to pace again at the McLaren Vale half. I initially said I’d pace 2:15 but quickly switched to 2:00 after I was told by someone involved in the running club (who shall remain nameless) that 2:15 was a ‘BS’ time to be pacing. No disrespect intended but 2:00 was likely to be a more popular target time and therefore one more in need of a pacer. Why pace again? I had this elusive PB, now almost 18 months old, that I couldn’t seem to break. I had come within 10 seconds in May (which over 21.1km is VERY close) and in the ensuing months had set new PBs in every other distance. Pacing would remove all possibility of breaking my PB of 1:42:43. Well, there was the small matter of the Masters Games half marathon the previous day. Here I WOULD be targeting a PB. By all accounts it was a tricky course, being the same course used the last time the Games were held in Adelaide. It was a 4-lapper, so roughly 4-and-a-bit parkruns. My PB was set at the 2014 Greenbelt half which was an undulating but net downhill course. I didn’t really know how to pace it. I knew I should be able to get the silver medal but there was a chance that my 5000m conqueror, Lisa, might not be running. Other than tying her shoelaces together (which one running buddy did jokingly suggest) there was little chance of my beating her considering she had won the Adelaide half in a time well beyond anything I’d ever done! Only the fact that she was wanting to have a good run at the Melbourne half the following week would give me any chance. I had initially targeted the Masters half as my chosen event for a virtual run organised by fellow runner Chris. A virtual run is a popular way to raise money for a given cause, by encouraging people to sign up to run a particular distance (anything from 5km to 150km, either in a single run or cumulative), pay a registration fee, and get a sweet medal! You know me, anything for more bling! Chris was running some ridiculous number of marathons over 24 months to raise money for cancer research. I don’t know how he does it – 2 marathons in 6 weeks nearly did me in! The rationale behind choosing this event was because usually for a half marathon you get a finisher medal but in the Masters Games it’s only the top 3 in each age group that get a medal. At the time of entering I expected a lot of competition so would not have even considered a medal as a possibility. As it turns out, under-40 females don’t tend to enter Masters Games athletics events. (The low numbers may have also had something to do with the Oceania Masters Games being scheduled at the same time. In the Cook Islands. I have no idea why anyone would want to go there…) So a medal was a distinct likelihood. Given that I would be getting a finisher medal for pacing at McLaren Vale, I decided to mark this unique weekend by making my ‘Virtual Run’ a marathon, run literally in two halves, across the weekend. I always like to talk about preparation. Be it superstition or actual science (let’s face it, most likely the former) I find it helpful to review my pre-race prep to determine where I may have gone wrong or right. 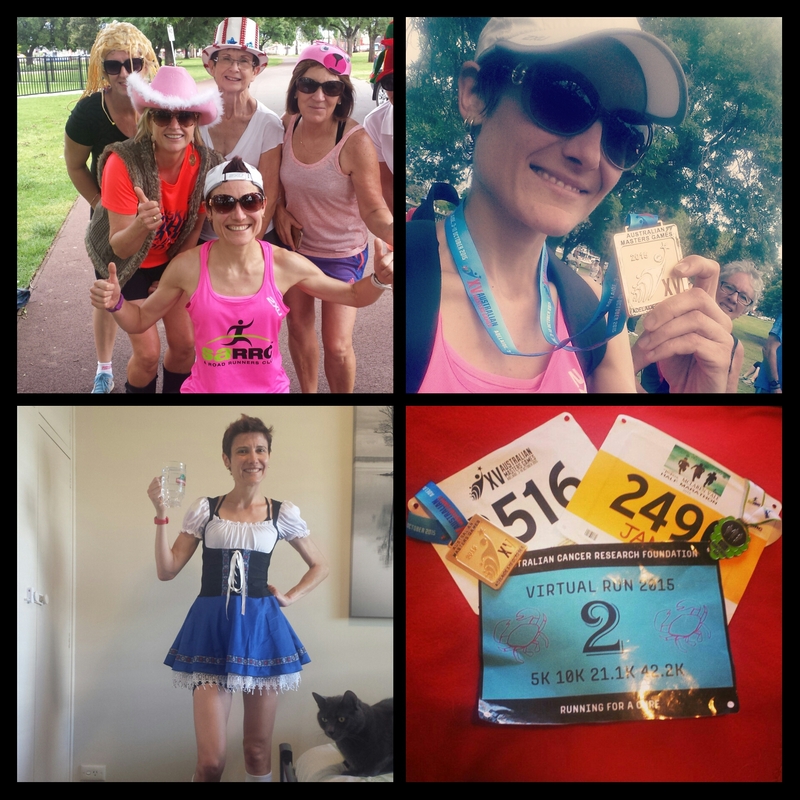 My lead-up week was (appropriately) similar to a marathon week. I ran Tuesday reasonably easy (it was a hilly run so it wasn’t exactly easy but it wasn’t fast) as a recovery from the 5000m on Monday. Thursday I had a good solid hit-out. Then I walked on Friday morning because I’d entered the City Mile on Friday night. I won’t talk too much about that (because it would take longer to write about than it took to run!) but it was a bit of fun… 1600m of going hard and fast! The course was lovely, running past the Adelaide Oval to the roar of the crowd (OK so the crowd were there watching an A-League blockbuster, not us, but still…) and finishing with a run across the Riverbank Footbridge. It also included a nice little downhill (which I would grow to love) and a nasty little uphill coming out of Elder Park (which I would grow to hate. Very much.) It was a warm and muggy night and my new hi-viz yellow singlet seemed to be the favourite of every bug in the place! I did a respectable 6:19 and finished second in my age group (again, after Lisa who was also first female overall). It took ages to get home by bus (I’d gone with public transport because I thought the football crowd would make parking difficult) and I was getting hungry so on impulse I stopped at Grill’d on The Parade for a mushroom burger on my way home. Race morning I had my usual breakfast and wore my new pink SARRC top which had already been ‘broken in’ in the 5000m. I went with my black lululemon skirt rather than the black and white… I knew I was tempting fate here because it was the black skirt I had worn for the ill-fated Clare half, and I’d done 2 good marathons in the black and white. I had taped both feet as usual to prevent blisters. The start was delayed a bit to ensure we didn’t run into the Torrens parkrun which was due to start at the same time, and covered part of our course. The day threatened to be hot but it was mild and overcast as we prepared to start. I don’t like to start too close to the front as I have a tendency to go out too fast. But hardly anyone seemed to want to start at the front (and it was a modest field anyway) so somehow I found myself right on the start line. I didn’t have a pacing strategy as such. I just wanted to keep a consistent pace throughout. I had set my watch to alert me if I ran outside the range of 4:35-4:50 minutes per km. Looking back at my Strava data, without getting into too much analysis, it looks like the first 2 laps were faster than the second 2. This is the opposite of what I have previously aimed for in half marathons but it makes sense. By lap 3 it had started to warm up. I also found the halfway point the hardest part of the race… getting to the end of lap 2 and knowing I still had to go around twice more! I ran behind fellow parkrunner Donna for the first couple of laps. I knew she was carrying an injury and might slow down, I was in no hurry to pass her, quite happy to sit behind her and let her set the pace! I didn’t want to pass her until the final lap but I think it was just before the end of the 2nd lap that I realised she (and therefore I) was slowing and I needed to get past. Maybe that’s another reason why I found it hard around the halfway point – I’d lost my pacer! I did find the 4 laps the most difficult aspect of the course. Early on there was the aforementioned downhill which I used to my advantage… I knew when it was coming up and ensured I was positioned so I could fly down and gain some valuable seconds. On one of the laps I had to negotiate cyclists going both ways, another runner and some walkers. I tucked my arms in close, called out ‘coming through on your right’ and managed to get through without hitting anyone. The uphill out of Elder Park also happened to be where one of the official photographers was positioned so of course I had to pretend to be enjoying myself! After going past the photo-op I would plod up the (thankfully quite short) hill, cross the river via the bridge, thank the lovely volunteer marshalling on the corner and head back along the very familiar northern side of the river, part of the parkrun course. I knew my previous PB pace was 4:49 minutes per km and when I got to the final lap I knew that PB was going down! The next question was, could I break the 1:40 barrier? I thought under 100 minutes was a nice mark to aim for. On the final lap, especially after passing the dragon boat crews and parkrun friends for the last time, I got my second wind. I managed to pass one more woman, who had looked really strong. I had seen her in the distance and didn’t have any plans to pass her – not that she was in my age group so it didn’t really matter – but suddenly there she was and I found myself needing to pass her otherwise I was going to have to slow down. I thought she’d probably run me down before the finish line but she didn’t. With 1km to go I did a quick calculation. Barring disaster, sub 1:40 was a done deal! I did contemplate pulling back at the finish to give myself a chance of beating this new PB, but didn’t. I went for the customary sprint finish – I think I passed one more woman just before the finish chute. I was glad I had a strong finish as both of my parents were there to see it! Sunday’s kit was, as per tradition, a costume rather than a running outfit as such. I’d gone with German beer wench (possibly ironic given the event was being held in one of SA’s best known wine regions) in honour of Oktoberfest – given the race was being held in October! I had never run in it. Not even at all. Rule #1 of running – don’t try anything new on race day. I made it to the start in plenty of time (I had actually thought the half started at 8 – turned out to be 8:15. Oh well – better early than late!) I was feeling the effects of the night before, continuing to rehydrate right up to the start. This of course had the undesired effect of me spending the entire 2 hours of the race counting down the minutes until I could get to a toilet! I attached my blue balloons and positioned myself in the middle of the field. My pace alerts were set for 5:30-5:45. 5:35 to 5:38 was where I was aiming to stay. This was a much easier course to pace than Adelaide. For one it is much flatter, meaning it was easier to maintain consistent pace than on the undulating Adelaide course. Also the smaller numbers meant my rhythm wasn’t broken up so much by needing to pass people. Finally I’d started my watch on the starter’s gun, meaning that I was aiming for sub 2 hours gun time, so anyone who finished in front of or close to me, regardless of starting position, would break 2 hours. I had people run with me for a while and then go off alone, much like Adelaide. Some I knew, some I didn’t. I spoke to a number of people after the finish who had either been just behind me or in front and had broken 2 hours. The out and back nature of the course meant that those who were in front of me got to see where they were in relation to me. It was a great feeling to have had a small part in helping them reach their goals! Happily the outfit didn’t give me any chafing or other problems. Again it was the balloons that were more annoying than anything else I was wearing! Passing barbed wire fences and going through tunnels was particularly problematic but both balloons survived the 21.1km journey intact! So there you have it. Cumulative marathon complete. 2 medals and another to come for the Virtual Run. Ideal prep for a 105km ultra in 2 weeks I guess? Time will tell! I can’t recommend the Masters Games highly enough. I barely scratched the surface with my involvement but I’m definitely keen to go again – especially if it involves travel! I wish I had gone to more of the social events in the evenings but it’s hard when you’re working during the day. So if you’re 30 or over – pick a sport (or 3!) and get involved! Well done! I love your description of the Masters course. At the time I hated it and did badly; but your description made me realise all the good things about it – the atmosphere with other events on at the same time, the vitality of the rowers village, the encouragement of the Torrens parkrunners and a photographer at a tricky little up-hill section. Thanks! Next PostNext 100km – a whole new ball game!